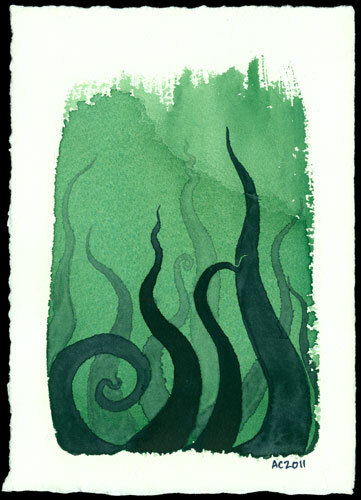 This piece most closely reflects the very first Tentacle Deeps watercolor I did, I think –the same paper, no fancy salt or pen-and-ink effects, just the layers of watercolored tentacles reaching up from the bottom of the page. The wash was a bit more layered and random, and whenever a tentacle “breaks through” the upper right corner, there’s a little bit of a skip as though it’s breaching the surface of a pool, or slipping between realities. 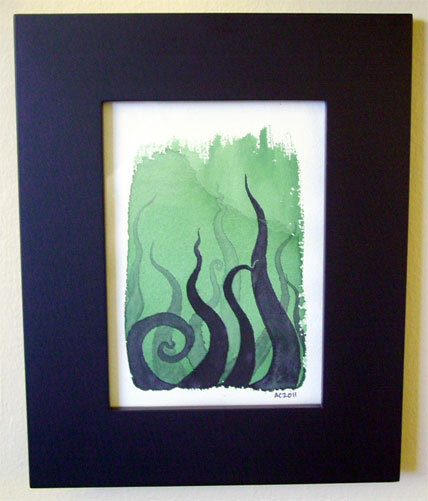 Tentacle Deeps 7, 5″x7″ watercolor on watercolor paper.